A few weeks ago I happened to be in a Christian book store and noticed a new edition of the God’s Word translation. Of the meaning-based translations, I think GW is generally the best (better than NLT), despite a couple of translation issues (i.e. δικαιοσύνη translated as “God’s approval“ in the NT, rather than the more familiar “righteousness”). 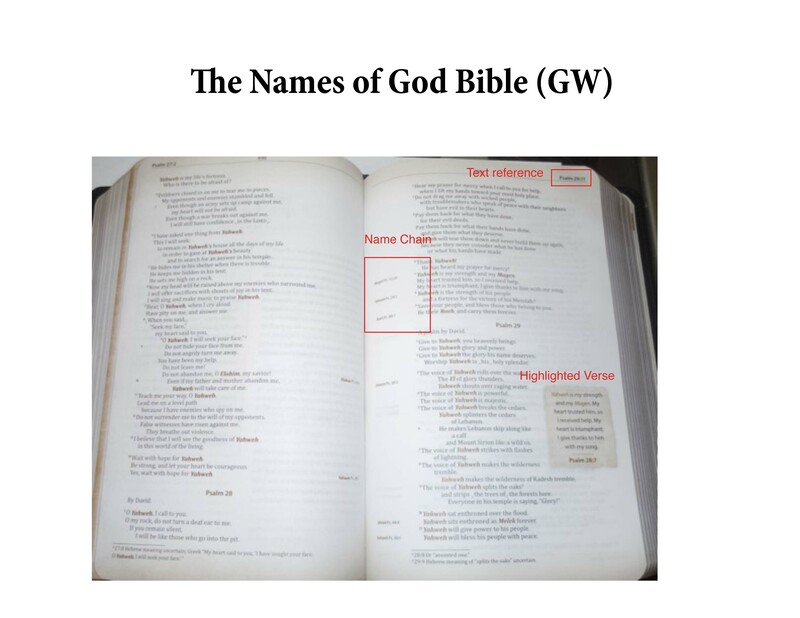 This post is not about the GW translation, but rather how it is used for this special Names Bible. I like what Baker Publishing recently has done with published versions of GW. And so I was intrigued by The Names of God Bible. Thank you, Brian Vos, at Baker for kindly sending me a copy of this latest release of GW. There is much to like about this Bible. The duravella black cover is appealing, supple, and workable. On the right side of the cover top to bottom the publishers have engraved (not just printed) several names of God in Hebrew. Nice touch! Perhaps the most impressive thing about this Bible is the attention to details, even of what might seem insignificant. Yet it is exactly those kinds of details that can enhance long term use of the Bible or occasional use. For instance, Baker put the Scripture reference in the top outer margins (some earlier editions of GW did not have that). Small point, but important. Opening the Bible randomly gives a pleasant visual look at the text. I wasn’t sure how the names in Hebrew transliteration would look in the text itself. If the publishers had used the same black color as the rest of the text, then it would be difficult to pick out the names. At the same time, an overwhelming color would have be distracting in the text. Baker took great care in choosing the font color for the names (which is always italicized); the name font is easy to identify without overwhelming the senses, even when many names appear on the two-page spread. That same color is used in transition from the top and bottom of the page, which creates an inviting and comfortable look to the reader. Even after studying and reading for a long period of time, the color combination and page display is “just right.” The color also appears in a slightly darker tint on the sidebars that highlight an individual verse on the page. This draws attention, but again without distracting from the text itself, either the main text of the boxed text. Having those sidebars without the “normal” text box border helped; they have a very slight broken edge shadow—looks like it was ripped from a piece of paper. The chapter introductions and the Name pages have a slightly dark tint of the page color, with a decorative design across the top. Makes each of them easier to find. This Bible is probably the best visual layout that I have seen. Well done! So, how does this help the English reader? One quick example is 2 Samuel 11. This chapter relates the events of David’s adultery with Bathsheba and his murder (through the army) of her husband, Uriah. No name of God is used in the entire chapter—except the last sentence of the last verse, 27: “But Yahweh considered David’s actions evil.” The visual clue of the font color makes it stand out immediately. I wasn’t even studying or reading the chapter, just glancing through. But when you see all the previous chapters with multiple names of God, and this chapter with none, your attention snaps to that point. The Name pages are perhaps the key thing in this Bible. Ann Spangler looks at the Hebrew names of God and provides a two page spread. Each section provides three items: The background of the name, praying using that specific name, and then promise(s) related that name. This can be very helpful to the English-only reader. I like the idea of praying using the various names. And the promises section focus on 2-3 verses that apply the name in a context of “this is what God has done or is doing.” Good feature, and of course, the purpose of the Bible. If someone wants to buy this Bible, then it is helpful to keep in mind the self-imposed limits of Ann Spangler. The names feature is primarily Old Testament. One limit is this: “a translation that prints the most significant names and titles of God in their original language” (p. xii). I have highlighted the word “most” because as I began reading through it (before reading the Introduction, like I usually do with Bibles, computer books, etc. ), I began to pick up certain titles that were not highlighted, and I thought, What? So, I did then next logical thing, I read the Introduction. Duh. But there are some puzzling omissions (and even errors)—see further below. With all that this Bible provides, I almost hate to mention a negative side of the Names of God Bible. Yet, the items I mention directly relate to the purpose of this Bible. With one exception, all of the English names and titles of Jesus remain in their English translation. To restore the originals would have meant rendering them in Greek, which might make the New Testament difficult for lay readers like myself to read with ease. But to emphasize the connection between the Testaments, I have chosen to render Jesus’ name in its Hebrew equivalent, Yeshua, a name that carries significant echoes from the Hebrew Scriptures. I find this statement almost contradictory. How is it that rendering Hebrew names and titles in transliterated English is “easy” for English readers, but Greek names and titles transliterated into English is too difficult? For English lay readers, transliterated Hebrew and transliterated Greek are essentially the same. To me, this is a significant omission. One example of where this connection would be helpful is the disconnect between the two testaments, ironically the very thing Ann wanted to provide readers. As I studied some of the Old Testament titles that are applied to Jesus in the New Testament (“Mashiach” Messiah), it would make sense to highlight that in the New Testament (i.e. Psalm 2:2-3 and Acts 4:25-26). In the introduction to Psalms, we are given a list of names and titles that are highlighted. The last one is “Rock” (Tsur). Yet in Psalm 62:2 we find “He alone is my rock (Tsuri) and my savior (Yoshuathi, related to Yeshua). Yet neither is identified in the text as a name or title of God. And here is a clear example of the connection between the Old Testament “my Savior” and the title applied to Jesus in the New Testament. One puzzling omission is the title “Mighty One” (Avir) in Psalm 132:2, 10, with a total of 23 times (most referring to God) in the Old Testament. Notice the critical importance of that title in Genesis 49:24 “But his bow stayed steady, and his arms remained limber because of the help of the Mighty One of Jacob, because of the name of the Shepherd, the Rock of Israel…” (GW). So also, Isaiah 1:24; 149:26; and 60:16. In other words, this is not a side name/title, but the very heart of what the Bible reveals about God. Some omissions occur with names/titles already identified. Mashiach (“Holy One” or “Anointed One”) is repeatedly referred to in the Old Testament, but not in Ps. 132:17, “There I will make a horn sprout up for David. I will prepare a lamp for my anointed one.” It is the last term, Mashiachi (“my Anointed One”) that is not highlighted, but should be. Then Yahweh (the critical name of God in Exodus 3) is always highlighted with transliterated English, except in Lamentations 1:10; 3:22, 24, 25, 26. And yet in the same chapters, in the same context (i.e. 3:28) Yahweh does appear. Not sure if this is an editorial oversight or intentional. My guess is oversight, which can be corrected in future printings. However, I noticed these inconsistencies, omissions, and editorial oversights after using the Bible for only a few hours. I have no idea how many others there are, if there are, in the rest of the Bible. And would an English-only lay reader pick up on these inconsistencies? Probably not. And especially with Yahweh who would know that LORD is the English translation of it, since the explanation of the connection found in most Bibles does not appear in this one. One other thing I missed was a set of maps. Even the eight-page variety would be useful for this Bible, especially if someone only had this Bible for use. Book Introductions: Each book introduction is about a page, focusing on only the essential topic/flow of the book. Then at the end of each introduction is a list of the primary names of God used in the book. Obviously this is for quick reference and not designed to be a study Bible in the usual sense. This helpful feature could benefit the reader for further study. End Matters: The following also aid the reader of the Bible in knowing and praying the names of God. Each of them can enhance the Bible reading experience. There is much to commend this Bible for the English reader. The layout, visual appeal (typography, color, etc. 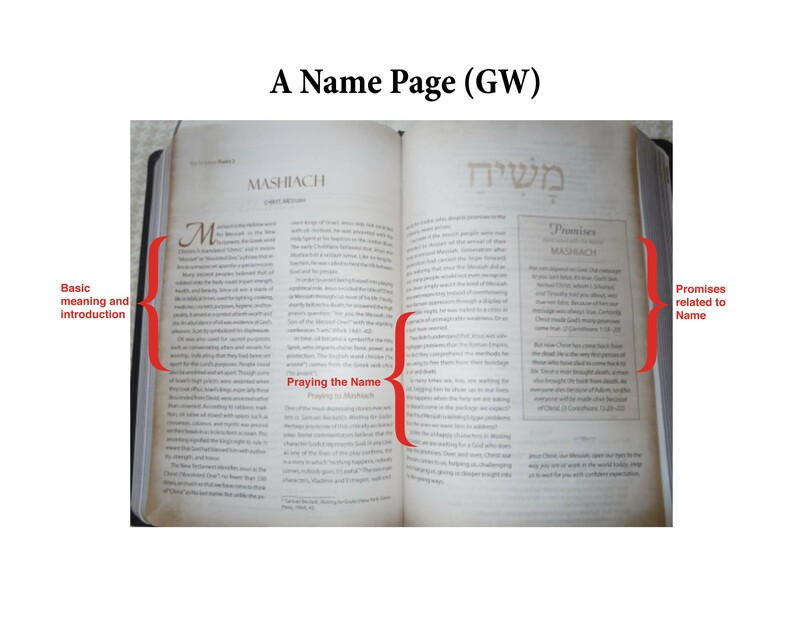 ), the Name pages, study aids for Names all contribute to a helpful Bible. My only reservations relate to some of the items noted above. This a good resource, but with a little more refinement could be an excellent one. Would I recommend this Bible? Yes, I would. A student of the Bible will be well served by this. And I will use it as a reading Bible due to its pleasing appearance and reability. Thanks, Baker for this new tool. Rich, thanks for a great review of this Names of God bible. I haven’t seen a bible with a great layout in a long while. I don’t actually have a GW version myself. I think it might be an underrated translation in the bible world. I wonder what it would need to get more exposure to Christians out there? It is under-rated. Personally if they could even add “righteousness” in brackets behind “God’s approval” I would select God’s Word as our primary worship Bible/translation. It is easily read, and makes a great oral translation (others are not so good there, ESV, NAS, etc.). Thanks for the detailed review, Rich. I use the “old” GW translation. Jenni, see my comment to Erma below. haha. I didn’t get it at first. Yes, “God’s righteousness”, the mark of God’s approval (as opposed to our own righteousness). GW does read well. There’s new competition at this reading level now: CEB and The Voice. I’m little familiar with CEB but not so much the Voice. It’d be interesting to compare all these translations. I have looked at the Voice. I would say it is not in competition with GW; GW is far better. The Voice would be closer to The Message. Check the passages that deal with Baptism or the Lord’s Supper. I would not recommend either of them to anyone. With CEB, in some places it does well, others, not so well. I don’t think that “Human One” is a good replacement for “Son of Man” (Matthew 25:31, etc.). Also, CEB in Rom. 3:24 “But all are treated as righteous…” Does change the sense some of what Paul means? Still using my original GW translation; now need to really look into the new one. Thanks for the insights! Do you mean the red covered one with NT only (from 1988/1992)? Be sure to keep that one. It is the best of all of them. So you can use both that one and this. If it is one from 1995, then there were some changes (in translating some prepositions) after the first edition, which made it better.